With a musical maturity that belies the band's age and experience, Eric and the Sliders' self-titled debut album is easy to listen to and full of promise. With a Rob Thomas kind of lyricism and memorable guitar sounds throughout, the song "Chasing After You" has "single" written all over it and makes for a perfect start to the album. The feeling is carried over to "City Lights," full of feel-good moments and fun lyrics with a terrific build to the end. The raw emotion and simple construction of "Way She Moves" makes the song an instant favorite, reminiscent of the Plain White T's or acoustic Death Cab for Cutie. The intricacies of singer Eric Goldberg's voice are at the forefront, while the sentiment of "souls with too much to carry" weighs the song down in an impactful way. 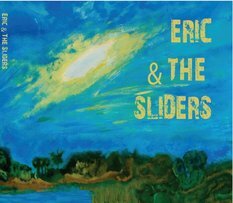 Previously a classic rock cover operation with jam band tendencies, Merrick-based Eric and the Sliders headed in a pop/rock direction in May of 2009 and hasn't looked back. The new sound, current and commercial, suits the foursome well and puts the band in the same rising-star category as local favorites Walking Upright. Although the production quality is lacking at times, and some of the arrangements feel a bit too safe and level, the natural ability and thoughtful artistry is obvious throughout this solid first effort. Definitely worth a listen. And another. And another. Catch Eric and the Sliders at this year's Bamboozle fest in New Jersey on May 1, or visit them at http://www.ericandthesliders.com. A witch. A wizard. A young boy, mourning the loss of his parents, who transforms his grief into courage to save a city in the clouds. Though the coming-of-age journey young Donovan Bale undertakes is reminiscent of Wonderland's Alice or Oz's Dorothy, author Soda makes sure it's fresh and different in all the right places, making "The Wizard of Odd" an endearingly sweet read. "The Wizard of Odd" develops themes of childhood wonder and unquestioning belief in right versus wrong, almost as if a wise child himself were crafting the story. Donovan and his friends are quick-thinking and lucky, yet vulnerable enough to feel real. A few twists at the end make for an overall enjoyable story that children and adults of all ages can enjoy. The piercing purity of the entire story is a reflection on the heart of its author. Soda is an artist through and through, able to breathe beauty into life whether with music or prose -- a rare ability. 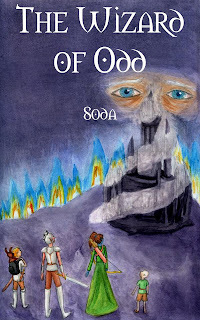 "The Wizard of Odd" is certainly a triumph that will leave the reader looking forward to more from multitalented Soda. With such divergent backgrounds among its numbers, Carver's sound feels a little like sitting at the intersection of three different musical roads. At its January 31st show at NYC's The Bitter End, the band drove straight to the point: with a level of tightness that surpasses expectations for such a relatively new project, there's definitely a niche for Carver among NY's indie rock scene. Former solo songstress Jackie Pop's vocals are strong, alternately bright and brooding, with an ability to wail that's tough to top. Guitarist Wayne Silver nailed a few serious solos, in particular during Pearl Jam's "Jeremy," which the band covered with precision though its interpretation of the song as a whole could have been harder. Bassist Brian Starke even landed a solo in "Deaf in One Ear," a moody song with the potential to be a single. Keyboardist Adam Zirkin adds an ethereal element to the band's capable song crafting abilities, and drummer Ilan Harel sets the energy level high enough to keep the crowd involved throughout the show. Going by the band's previous experiences -- three of its members came from Sputniks Down, which started out as a jam band several years ago -- I initially feared the jam band roots would dominate the show. That wasn't the case at all. The band's other parent, alt/rock band Seer, balances the sound perfectly. Carver has a uniquely appealing style to its noise, kind of like a modern-day, female fronted Led Zeppelin. Three distinct roads brought the band to where it's at today, but if Carver keeps up the hard work and intensity, there's only one road the band can go down, and it leads directly to musical satisfaction. Watch out, Miley Cyrus, Jonas Brothers and Demi Lovato. Sisters Jessica, Rebekah and Destiny -- otherwise known as the band Petrel -- introduced their pop-infused rock sound to a packed house at Vibe Lounge in Rockville Centre on Thursday night, and they've got you on their radar. Given a little time and effort under their ever-trendy belts, this perky trio will no doubt establish itself as one of the premier names in family friendly rock-n-roll. From uplifting rock tracks like "All Right" and "Lovin' Life" to the sugary, disco-dancey "Show Me," Petrel's polished studio collection shows their promise as budding songwriters and musicians. Vivacious lead singer Jessica bopped around the stage, drawing the audience into the show despite some tentative moments. Well-done vocal harmonies added some depth to the live performance. One thing's for sure: the 'tweens in the audience, no doubt in the process of happily staying up past bedtime to watch Petrel rock out, enjoyed themselves so much they lined up for photos and autographs after the show. Cyndi Lauper described it best when she said "Girls just wanna have fun" -- Petrel certainly looked to have plenty of it onstage and didn't hesitate to help the audience have their share, either! Anger, elation, confusion, contentment, despair - the debut effort by Long Island, New York-based indie pop/rock band Smile Pretty Misery will take you through an entire menu of emotion before leaving a satisfied taste in your mouth. I was hungry for more of these guys after listening to the six tracks comprising Measured in Miles (August 2008 / self-released), a short but well-developed collection full of variety. Careful and detailed composition is the first striking feature of the collection, especially on "Blood Red Ink," which adds strings as a backdrop to the dark picture the song paints. Irony and metaphor reminiscient of Jason Mraz and Fiona Apple are common lyrical techniques, as demonstrated on the track "Happy New Year" with lines like "Seems all broken-hearted dreamers have nothing more to teach us / When they become presented with problems they can't solve." In "Snake Oil Man," with lyrics like "He speaks in Ragtime riddles / He's peddling peace of mind / He's a regular broken-record salesman," the point is so cleverly stated that it could be about almost anyone, from a drifter ex-lover to President George W. Bush. Smile Pretty Misery demonstrates a capacity for songwriting much more mature than its two-year history as a band would otherwise indicate. Perhaps it's due to lead singer Jaymes Welsh's classical opera background and the resourceful style of drummer Chris Bonacorsa, or perhaps it's due to the energy of bassist Mike Bayer or guitarist Al Domingo's prior experiences playing with a host of well-known Long Island acts. Whatever the case may be, Smile Pretty Misery has clearly made a smart move with Measured in Miles, satisfying through and through. She may be 18 years old, but Michelle Branch is no Britney Spears or Mandy Moore. Her debut album, The Spirit Room, injects the music world with a new and decidedly better strand of teenage girl-pop. Branch's first single, "Everywhere," received minimal play until the mid-August release of American Pie 2, in which the song is featured. Definitely the most upbeat song on The Spirit Room, her vocals are strong and clear, just one of the several sides she shows listeners. She sounds quieter and sweeter in "You Get Me" and a little trashy in "Something to Sleep To." Long-faced and pretty, she writes or co-writes her own music, unlike many artists her age: a definite credit to Branch. Just like those other artists, though, the lyrics are youthful, and romantic almost to a fault. On "If She Only Knew," Branch sings, "I know she loves you and I can't interfere / So I'll just have to sit back and watch my world disappear." Overal, Branch's sound comes off like that of a female counterpart to Nine Days or American Hi-Fi, and at times like the funky Nelly Furtado. She has been quoted as having a "love affair" with her music, apparent in the energy that dominates the whole project. If she keeps it up, her love affair will likely fuel her through the tours and follow-up albums that come with the popularity headed her way, as "Everywhere" and The Spirit Room propel her upward. The world needs a little lesson in anger management. 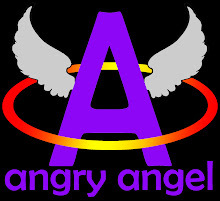 Angry Angel is here to share some art therapy.